Full moon, total lunar eclipse this weekend, also known as the blood moon. This is the third eclipse in an 18 month tetrad. The process in the upcoming days is aligning us to find more harmony and balance in our lives. We are becoming more vibrationally tuned to the frequency that Earth is vibrating at, and many of us are being confronted with facing the darker aspects of ourselves. These are being pushed forward so that we may illuminate them. As we work with the heightened energies of the blood moon you’ll begin to see the veils lift before you as the mists of time withdraw themselves. Stay grounded and relaxed over the next few days. Make a point to breathe, center and meditate as needed. 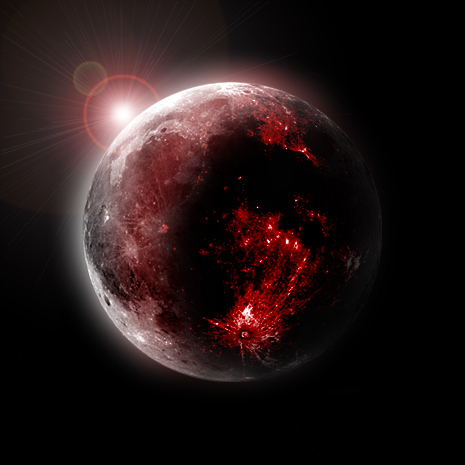 There is a huge changeover taking place and its being instigated on the blood moon. This transition will guide you through a deeper process of reunion with Self. The shift will bring about an intense clearing and purification. If it begins to feel intense, stay centered, trust and have faith. Things are being brought into balance to achieve a state of oneness. If you are called, remember to offer assistance to whomever needs it. You will be serving your and humanity’s highest good. The Moon will be eclipsed completely for approxmately 5 minutes. From beginning to end, it will last for 3 hours and 29 mins. This entry was posted in Blessings & Rituals, Stories & Events and tagged April 4 2015, Blessing, Blood Moon, Earth's Vibration, Easter, Full Moon, Living Fae, Lunar Eclipse, Oneness, ritual, Unity Consciousness.